Today I welcome TJ Nichols to the blog to answer a few questions for Interview³. I’ve always made up stories but I never wrote them down. I like creating new worlds and adding magic to this one so urban fantasy and fantasy was a natural fit. I wrote Warlock in Training but then had no idea what to do with it. It was as I was poking around for publishers that I saw Dreamspinner had a call out for their Advent Calendar so I wrote a novella for that and worked on polishing up Warlock. Both went onto be accepted. Since then I’ve written another 2 Christmas/Holiday novellas (Poison Marked will be out in December), as well as a novel for the Order of the Black Knights series. Um...other people have said it’s descriptive and creative. I always hope I’m writing something enthralling and just a little seductive. I don’t know that I have any. I have never tried to write like anyone, I’ve always written what I wanted. Daggerspell by Katherine Kerr, The Dresden Files by Jim Butcher and Romeo and Juliet. Laptop, paper and pen. I do all of my plotting and scheming on paper, so if I get stuck I need to switch from laptop to paper. I write at the kitchen table or sometimes at my desk. When editing I like to walk on the treadmill as it helps to keep me focussed. An agent and a big five deal would be up there. I have a crime series that I’ve plotted out that I really want to write, and a sweeping fantasy novel. Maybe next year. Read everything. Write and learn how to set goals so that the hour of writing time doesn’t become an hour (or 2) on YouTube watching male ballet dancers. I’m writing the third and final Studies in Demonology book at the moment (yay! But also sad because I’ve grown very fond of Angus and Saka). I’m also going to tackle either the first crime book or the fantasy. And I have to clean up a historical urban fantasy that I wrote earlier this year. 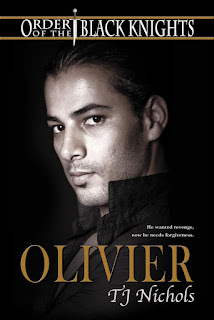 Olivier (an Order of the Black Knights novel) came out in July. The Order of the Black Knights is a multi-author series about a group of men who are trying to break free of a curse, the catch is in every life they kill the one who could save them when they need to forgive. I like the idea of past lives and thought the concept was interesting (if a little darker and less magical than what I usually write). Olivier is a pretty damaged hero who knows he can’t keep living the way he has been, but doesn’t know how to change…until Cody appears in his life. On one hand Cody threatens everything, but on the other he could save Olivier. However Olivier has just killed Cody’s brother so things are tense and messy and the lust they have is a prickly kind of thing best handled with care. Thanks for stopping by, Dani. Yes, clearly TJ has a strong sense of personal voice!